Like many websites, we gather information about how visitors use fila.com. In general, you can visit many of the web pages on fila.com without telling us who you are or revealing any personal information about yourself. We, however, may automatically track your Internet Protocol (“IP”) address and other anonymous information from your web browser for trends and statistics regarding your interaction with, and use of, our products and services (including, but not limited to, device identifier and hardware information, browser type and language, browser version, cookie information, system type, whether you have enabling software to access certain features, access times, referring website URLs, information about your purchases, pages requested and pages visited). You will remain anonymous unless you submit identifying information during any visit to fila.com. We may also work with service providers who use tracking technologies to serve ads across the Internet or track email communication response rates on our behalf. These companies may collect anonymous information about your visits to fila.com and your interaction with our communications, including advertising. Any personal information you provide us when you visit fila.com, register online or update your account, log-in, place an order online, contact us with a question or concern, participate in a contest, promotion, sweepstakes or survey, or join our social network sites is maintained on secure servers. We may collect personal information from you, such as your name, email address, postal address, phone number, credit card number (when necessary), gender, birthday and personal interests. 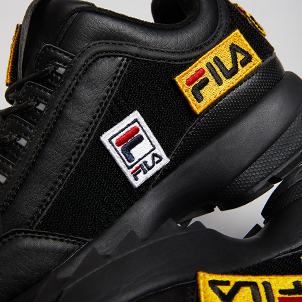 Fila maintains a record of your product interests and the purchases you make online. Fila may combine all of this information with information about you that Fila acquires with other information from Fila sources, transactions and communications, which may include, but is not limited to, information from; events, products, applications, joint marketing partners, and other Fila interactions. You may choose not to provide us with any personal information. Under those circumstances, you can still access and use many portions of fila.com; however, you will not be able to access and use those portions of fila.com or the services available on or through fila.com that require your personal information. You always have the choice not to receive marketing information. For instructions on opting out, please see the section entitled, Marketing Email Communications, below. Except as expressly set forth herein, we do not loan, give away, sell, distribute or rent your personal information to any third party. We may share your information with our service providers who manage our customer information and perform services on our behalf, such as payment processing, shipping, data management, fulfilling promotions, sending communications to our customers, conducting surveys, etc. We do not authorize any of these service providers to make any other use or disclosure of your information. We may share your information when we team up with a third party to offer or provide products, services, contests, or promotions to our customers. We may share your information, in the unlikely event of a sale or merger of some or all of our business, as part of the transferred business assets. We may share information about you if necessary, in our good faith judgment, to comply with laws or regulations or in response to a valid subpoena, order, or government request, or to protect the rights of Fila, the users of fila.com or the public. You can always review and change certain personal information related to your use of fila.com (such as your name and contact information). To access your information at fila.com, simply sign in to your account using your email address and password, and you will be able to edit your personal information in your account profile. 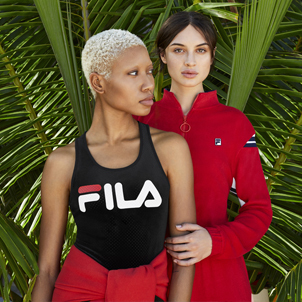 At various points on fila.com, you have the option to join our email list and receive promotional information, such as information about special offers and sales events. When you choose to opt-in to our email communications and submit your email address to us, we will send you an email requesting your confirmation. If you do not click on the confirmation link in the email, you will not be registered to receive our emails. We want to communicate with you only if you want to hear from us. If you do not wish to receive Fila marketing emails, you may opt out by clicking on the unsubscribe link found at the bottom of all Fila marketing emails. It may take up to ten (10) business days to remove you from our marketing email lists. When you set up an online account at Fila.com, you will be prompted to select a password. The retrieval of personal information relating to you and your order history is only available to you if you provide the correct password that you have created, and all profile information is only available while you are logged in to your account. After providing your password, you can edit or delete your information at any time through the “My FILA” page. If you forget your password, a new password will be assigned to you and will be emailed to your email address. We will not give passwords out over the phone, nor will we email them to a different email address than the one used to register. From time to time, Fila works with reputable third parties who perform services on our behalf. Sometimes these service providers need information about our customers in order to do their jobs, such as fulfill orders and promotions, maintain and manage our customer database and report on customer behavior and/or preferences. When Fila allows these service providers access to your information, we require them to maintain your information in the strictest confidence and we do not permit them to use it in any way other than to help us provide you with better service. We also work with other companies who use tracking technologies to serve advertisements on our behalf across the Internet. These companies may collect information about your interaction with us, including advertising. You may occasionally get cookies from our business partners or third parties. We have no access to or control over these cookies. Most internet browsers automatically accept cookies, but if you do not wish to have cookies on your system, you can set your browser preferences to refuse them or to alert you when cookies are being sent. In order to disable cookies, please consult your browser’s “help” section for instructions. Additionally, if you have an Adobe Flash player installed on your computer, your Flash player can be set to reject or delete Flash cookies. If you choose to decline cookies, you may not be able to fully experience the features of fila.com. Web beacons are small strings of code that are placed in a web page or in an email message. They are sometimes called “clear GIFs” (Graphics Interchange Format) or “pixel tags”. Web beacons are most often used in conjunction with cookies to track activity on fila.com. When you visit a particular web page, web beacons notify us of your visit. Since web beacons are used in combination with cookies, if you disable cookies the web beacons will only detect an anonymous website visit. When used in an email, Web beacons enable us to know whether you have received the email. We currently use the services of a few carefully selected companies to help manage and optimize our Internet business and communications. These companies help us to measure the effectiveness of our advertising and better understand how visitors use fila.com. To do this, a variety of methods to collect information on our behalf may be used, including, but not limited to, placing cookies on computer browsers and placing web beacons on our websites. The type of information collected in this manner includes, but is not limited to, pages visited, products viewed and products placed in your shopping cart. By supplementing our records, this information helps us to identify what pages are most attractive to our visitors, which of our products most interest our customers and what kinds of offers our customers like to see. The security of your information is very important to us. We use 2048-bit Extended Validation Secure Socket Layer (EV SSL) technology to protect the security of your online order information. 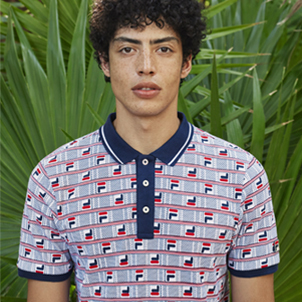 SSL technology encrypts your order information to protect it from being decoded by anyone other than Fila. Once you enter the checkout page your computer will begin communicating with our server in secure mode. You can tell that you are in secure mode when the first characters of the URL address changes from “http” to “https” and when you see either a closed lock or an unbroken key (depending on your browser) in the lower-section of the browser window (The URL address section will also turn the color green). Only browsers that use the 2048-bit EV SSL technology are able to order through fila.com. Fila.com may now or in the future include blogs, chat rooms, forums, message boards, and/or news groups. Any information that is disclosed in these areas becomes public information. You should exercise caution before disclosing your personal information via these public venues, which you do at your own risk. If you do so, you may receive, among other things, unsolicited emails or “spam” from others. Fila cannot safeguard the privacy of personal information that is disclosed online in this manner. Fila is concerned about the privacy and safety of young children and we do not knowingly collect any personal information from a child under 18. We do not sell products for purchase by children and all children’s items we sell are for purchase by adults only. Fila has posted Terms and Conditions of Use that set forth the terms and conditions under which we provide products, services and information to you from fila.com. Please review the Terms and Conditions of Use governing your use of, and access to, fila.com. It is your responsibility to read, understand and comply with the terms and conditions set forth therein.